Choosing Peer Reviewers: Art behind the Science | Sheri Spaine Long, Ph.D.
As Editor-in-Chief of the academic journal Hispania, I am frequently asked how I choose peer reviewers to vet submissions of original articles. Who are Hispania’s peer reviewers? Our peer reviewers are typically fellow educators and researchers who voluntarily evaluate submissions. The reviewers assess the overall quality of the paper’s content and technical readiness for publication. The purpose of peer review is to provide the author or authors with constructive feedback and render a decision about worthiness of publication. Hispania’s over 400 active peer reviewers serve anonymously. I am infinitely grateful to our peer reviewers because they provide hours of labor and lend their expertise to improve the journal. Peer reviewers provide this service gratis and with scant recognition due to the anonymous nature of the process. While the ultimate decision to publish lies with the Editor, peer reviewers strongly influence journal content. A number of factors shape my choices for peer reviewers. After personally reading each submission, I identify colleagues whose area of expertise matches it. Ideally I locate three individuals to evaluate every article. Intentionally I combine reviewers of different statures and/or ranks. This helps provide a variety of perspectives during the process. Generally I look for three types of individuals and balance them for each submission. The emerging scholar who is likely to be a doctoral student or hold the rank of assistant professor. Because Hispania is the flagship journal of the American Association of Teachers of Spanish and Portuguese (AATSP), my approach to reviewer selection reflects the culture of our organization. The AATSP supports and publishes the journal. 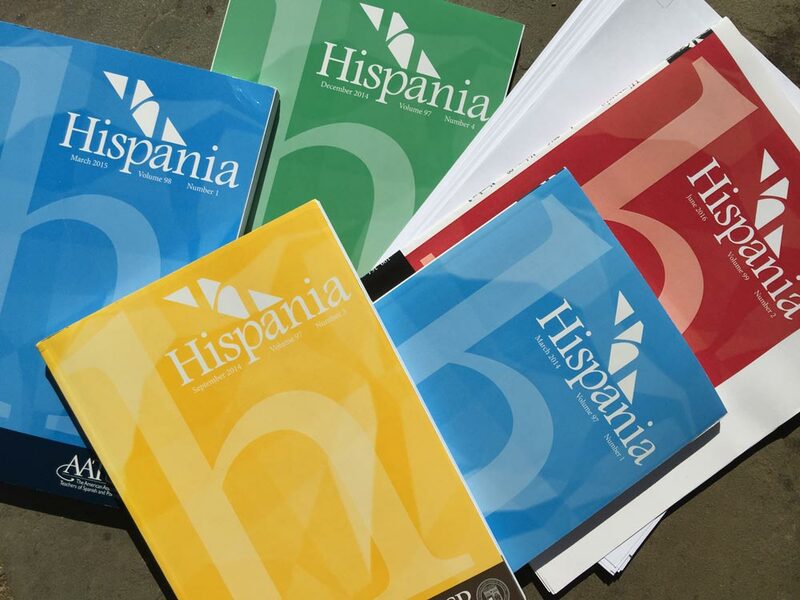 Hispania has a special responsibility to provide quality material to the association’s membership and journal’s readership. Simultaneously Hispania and the AATSP play an important role in cultivating and mentoring the next generation of academics. Hispania nurtures tomorrow’s scholars by encouraging novice academics to jump in and learn how to write a review by doing it. Hispania provides a detailed description of reviewer responsibilities (both technical and ethical) and a checklist of questions for peer reviewers to guide the neophyte step by step through the process. In addition the AATSP sponsors a number of sessions and workshops on the publication process at conferences for professional development. While delivering presentations about Hispania, I confirm that graduate students are invited to form part of our community of reviewers. On occasion I have heard a gasp of academic snobbery coming from a corner of the room. I do my best to ignore it because we need graduate students to perform peer reviews. There is also an inherent danger when only well-established scholars write reviews. By limiting the arbiters to an elite club of canonized scholars, we all miss out on the fresh perspectives and innovative scholarship that the rising generation provides. Over the years, I have noticed that doctoral students who are dissertating write some of the most detailed reviews. Doctoral candidates tend to be exceptionally current in the literature of their sub-specialty. They also possess invigorating enthusiasm for the process. Developing scholars quickly learn (what more seasoned academics know); the act of peer reviewing helps improve one’s own writing. The reviewer (also an aspiring author) becomes acutely aware of what peers read for during an evaluation. I have had several conversations with colleagues about the pedagogy of editing. In my role as editor, I teach (and learn) every day. Editors regularly discuss how much they enjoy the mentoring process. The nurturing that editors provide is an extension of our call to teach, to conduct research, and to serve. The development and mentoring of new peer reviewers is an important aspect of my editorship. Given the diverse membership of the AATSP and Hispania’s readership, The Spaine-Long Method includes my efforts to identify peer reviewers from the database that is housed in our web-based peer review and tracking system called ScholarOneTM. Given Hispania’s broad scope, it is not uncommon to go beyond our database. I perform online searches and/or request recommended reviewers from our editorial board members and knowledgeable colleagues with regularity. Imagine an article on the teaching of Spanish at the high school level. This submission requires the requisite scholarly peer reviewers who are researchers and are up-to-date on publications in the field. However, this submission is likely to require the perspective of a practitioner as well. A high school Spanish teacher can provide an insider’s insight. Imagine a submission that is heavily statistical. This paper is likely to require a mathematician or statistical reviewer who can carefully vet this aspect of the submission leaving other features to the content specialists. Imagine a paper that overlaps two disciplines beyond the language-learning field. The submission will require individual readings from several different backgrounds to comment on the diverse approaches to scholarship that interdisciplinary articles often feature. My examples are meant to underscore that the selection of peer reviewers is more of an art than a science. You have to think critically about who and why you invite an individual. I am not suggesting that The Spaine-Long Method reduces reviewer selection to a formula. Besides taking into account the unique needs of each article, I know from my experience in the field where to go with reviewer invitations and sometimes where not to go. There are often personal concerns, conflicts of interest to avoid, individuals from rival institutions to take into account, and so forth. There is a personal aspect to reviewer selection that cannot be done with computer software and fancy algorithms. The Editor-in-Chief handles submissions on controversial topics such as the scholarship of Spanglish. Submissions that focus on Spanglish, or other contentious subjects, merit special handling because current academic discourse is diverse and contradictory. Of course, responsible editors seek healthy academic debate and strive to publish multiple perspectives. In an attempt not to shut down debate, the careful selection of peer reviewers is crucial. At the core of my editorial responsibility is to seek fairness in the peer review process. Sheri Spaine Long currently serves as Editor of Hispania (AATSP), and she is the former Editor of Foreign Language Annals (ACTFL).